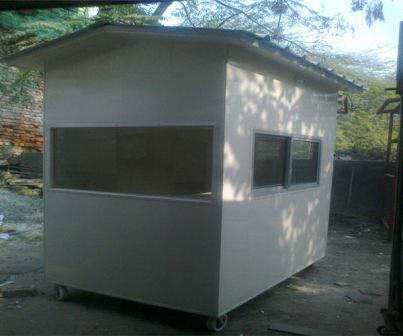 We manufacture and supply PVC Guard Cabins, Bison Board Guard Cabin, EPS panel guard cabin & PUF Guard cabin & guard cabins manufacturers in India that are long-lasting and portable. Our guard cabins provide security and shelter from ghastly weather condition. Best quality raw materials are used, thus they are better in quality. At the same point, our guard cabins are highly durable; we offer our guard cabins in a variety of shapes and sizes. We also customize our guard cabins to meet the needs and specifications of our clients. Consumers can avail this PVC guard cabin from us at industry leading price.